Cordless phone was invented by a jazz musician named Teri Pall in 1965. But she could not market her invention because radio signal of two mile range was interfered with aircrafts. The first cordless phones were introduced in 1970s. The FCC or Federal Communications Commission first granted the frequency range of 47-49 MHz for these phones to facilitate less interference and less power to run. The FCC later in 1990, raised this frequency range of 900 MHz. A cordless telephone replaces the handset cord with a radio link. 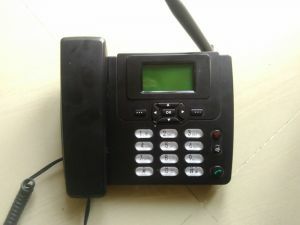 The handset of a cordless phone communicates with a base station connected to a fixed land phone line. 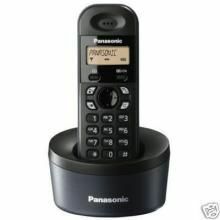 The range of a cordless phone is usually limited to the same building or up to some short distance from the base station. The antenna efficiency is one key factor that enables a greater range of the 900 MHz and 2.4 GHz phones. Cordless telephones need mains electricity to power its base stations with rechargeable batteries which are charged when the handsets sits in the cradle. 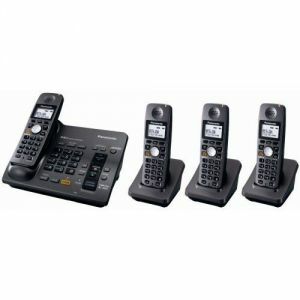 Panasonic 2.4GHz Digital cordless Phone Kx-tg3711bx, Siemens Giga set A490 Cordless Telephone, Panasonic KX-TG7743 DECT 6.0 Cordless Phone, INFINITY X1 Cordless Phone, Panasonic KX-TG7745 DECT 6.0 Cordless Phone, PANASONIC KXTG-3712 CORDLESS HANDSET SPEAKER PHONE, Panasonic Caller ID Cordless Phone, Panasonic HHR-P105 Cordless Phone Battery Type 31, PANASONIC KX-TG3712 CORDLESS DUAL HANDSET PHONE, Beetel - Combo Phone - Cordless - Telephone, Beetel - CB 54000 - Digital Cordless - Telephones. Rediff Shop Online has every best item of cordless phones from the best producer like Panasonic, Beetel, Siemens. Visit Rediff Shopping and check 244 items of cordless phones available at the amazing discounts with convenient EMI options. Every product you buy from Rediff Shop comes with Rediff Assurance of Return and Refund Policy.